Spin into the pop record scene. Enjoy the thrills of auditions, contracts, hit records and top 20 theatre bookings. Chartbuster was first published by ASL Pastimes in 1970, at a time when the pop music charts were exploding in popularity, after the era of Radio Caroline and the launch of Radio 1. There are two slightly different versions of Chartbuster. The first version had an image of a plain vinyl record in the centre of the box lid. 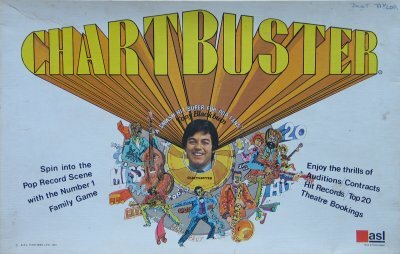 In the second version, published shortly after the first, the vinyl record was replaced with a picture of Tony Blackburn, when he officially endorsed the game. The amount of cards and playing pieces are the same in both versions, but there are minor tweeks to the rules and wording, in addition to the slightly different artwork on the lid.